IN A country where the average age of farming is 57 years old, it is a breath of fresh air to discover younger people going into farming. Meet 32 years old Irone Glenn "Yon" Cabalida, the Bagitong Magsasaka from Dalubhasa Farm in Tacunan, Tugbok, District, Davao City. Yon was first featured in the Storytelling #CacaoDavao social media campaign of the Department of Agriculture - Region XI (DAXI) which aims to promote emerging local cacao products from August to November 2018. "The Bagitong Magsasaka recalled his transition from being a graphic designer to a farmer. His passion to mold his own pure form of artisanal tablea allowed him to have a brand of his own product. I'm proud to showcase my uncle's story and the prize of his efforts," said Jamille Fortades in her winning cacao story. Exhausted by the pressure and daily grind in the corporate world, he was diagnosed with respiratory illness in 2015 and advised by his doctor to take a leave and have enough rest. "I planned to stay in our farm only for weeks until it turned into months, then years," he said, adding that it was also the time he learned to appreciate the simple but stress-free farm living. He then decided to go into farming and develop their one-hectare farm in Tacunan. While he finds more satisfying to produce food than graphic designs, he also encountered some challenges as a newbie in farming. "Having limited knowledge in farming is a major challenge but it was slowly overcome after I attended training and consulted agricultural technicians and cacao doctors," he said. He then applied the knowledge acquired in their more than a hectare farm and developed it into an integrated farm where coconut trees are intercropped with fruit trees and 300 cacao trees mostly BR 25 and UF18 varieties. Goats and rare breeds of chicken are also raised in the farm. "Cacao has a huge potential to improve farm income. Cacao beans can be sold either as wet or dried fermented beans. You can also opt to go into value-adding activities such as processing it into tablea or chocolate blocks," he said. Yon's eagerness to try new things and using the same creative approach in graphic designs enabled him to come up with his own brand of artisanal tablea product. Lack of adequate facilities did not hinder him to adopt a tree-to-bar concept from harvesting, pod extraction, fermentation, drying, roasting, grinding, and processing. "Makeshift facilities were used in fermentation through pail covered with banana leaves and an old bed as a dryer. We do the processing at home where coffee bean grinder was used in grinding and kitchen utensils for roasting and molding," he said but materials such as tunnel film as solar dryer are about to be in place. 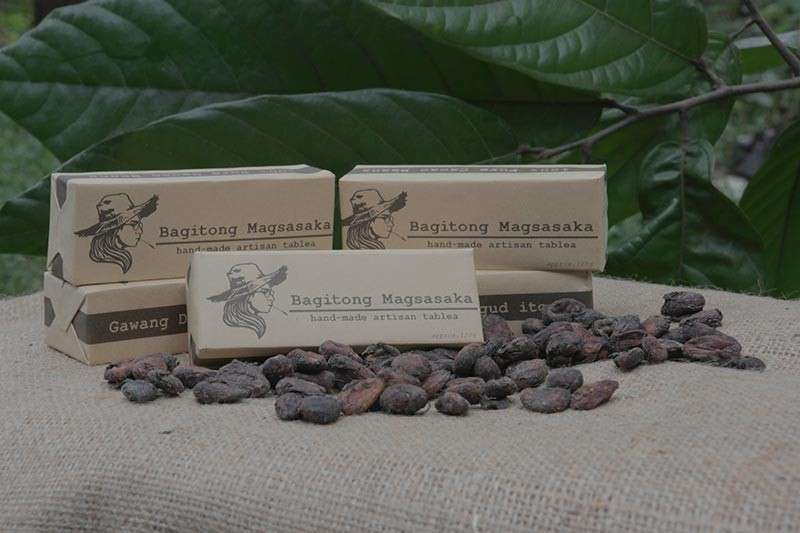 He now starts to market "Bagitong Magsasaka" tablea, a brand that personifies himself as a newbie farmer offering fresh ideas in an array of an increasing number of Davao cacao and chocolate products. The simple but elegant packaging has a graphic design that literally depicts his image as a young farmer with long hair and wearing a farm hat. "I also use coño lingo in our tagline: gawang Davao gud ito, to make it more appealing to millennials," he added. What sets his tablea product apart is its packaging and size. "I learned that tablea is from Spanish word tablet, so instead of producing round-shaped, I made it rectangular or in tablet form that weighs 120 grams. Aside from its unique shape, tablets are easier to package," he said. Although the Bagitong Magsasaka tablea is only less than a year with a limited market just yet, 300 tablets were already produced and have reached other countries such as Canada and part of Middle East. "Friends placed orders when I posted the product on my Facebook account and I received positive feedback. 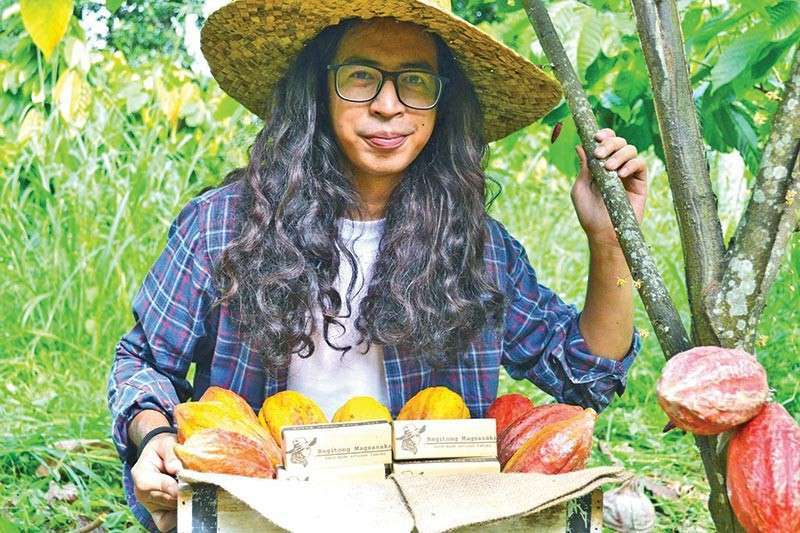 I am now working on our FDA permit to open up more markets and hopefully, we can eventually venture in chocolate processing," he said adding the social media posts of her niece further boosted the marketability of his product. While enjoying his career change, Yon has taken additional demands of agricultural advocacy, which is to promote organic farming and farm tourism. He said organic farming will reduce cost at the same time preserves the fertility of the soil. Recently, his farm was accredited as a learning site owing to its accessibility from the downtown area and how he showcases practical ways of tending crops and livestock. "I want to develop the farm as a learning site and eventually as farm tourism destination where visitors discover the huge potentials of agriculture and be inspired to produce their own food," he said. Asked on what's his advice for millennials to consider farming, "Never be afraid to get your hands dirty and start small even just in your backyard" was his quick reply.